The state of Michigan is "fundamentally accountable" for Flint's lead-contaminated water crisis because of decisions made by its environmental regulators and state-appointed emergency managers who controlled the city, an investigatory task force concluded Wednesday in a withering report. The panel, appointed by Gov. Rick Snyder to review the disaster, said what happened in Flint is "a story of government failure, intransigence, unpreparedness, delay, inaction, and environmental injustice." It also cited "intransigence and belligerence that has no place in government." "Flint water customers were needlessly and tragically exposed to toxic levels of lead and other hazards through the mismanagement of their drinking water supply," investigators said. Moreover, the 116-page report described as "inappropriate" a frequent claim of Snyder and his representatives that the Flint water crisis represents a failure of the local, state and federal governments. That suggests "that blame is attributable equally to all three levels of government," the report said. "The state is fundamentally accountable for what happened in Flint," it said. Flint's 2014 switch in drinking water sources led the supply to become contaminated when lead leached from old pipes and fixtures into some homes, businesses and schools. The Republican governor has repeatedly apologized for the state's role as some have called for his resignation. "One of the biggest lessons we hope to impart in our report is the need for government leaders to listen to their constituents; in Flint that didn't happen," said Chris Kolb, co-chairman of the Flint Water Advisory Task Force. While investigators primarily blamed the state Department of Environmental Quality — they initially did so in preliminary findings that led the agency's director to resign in December — they also faulted a host of other government offices and officials for contributing to the fiasco or delaying action to fix it. Those include the Michigan Department of Health and Human Services, the U.S. Environmental Protection Agency, the Genesee County Health Department, the city of Flint and financial managers that Snyder named to run the city of nearly 100,000 people. The five-member task force interviewed 66 people during its months-long investigation, issued 36 findings and made 44 recommendations, including considering alternatives to the emergency manager system. 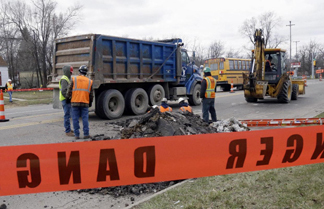 Michigan's environmental agency erred in numerous ways, the report found. Misinterpreting federal regulations, it instructed Flint not to treat the water with anti-corrosive additives after switching from the Detroit water system — which drew from Lake Huron — to the Flint River. The state DEQ did not change course even after an initial six-month testing period revealed elevated lead levels, the report said. It also provided inadequate guidance to Flint staffers on water sampling, snubbed offers of help from the federal EPA and dragged its feet on investigating the possibility that the city water system was contributing to an outbreak of Legionnaires' Disease. While others contributed, "MDEQ caused this crisis to happen," the report said. "Moreover, when confronted with evidence of its failures, MDEQ responded publicly through formal communications with a degree of intransigence and belligerence that has no place in government." The report also faulted Snyder's office for relying on incorrect information from the DEQ and other agencies even as evidence grew that they were wrong, waiting until last October to support returning Flint to the Detroit water system — a move that a member of the governor's executive staff had recommended a year earlier. Snyder, who attended a news conference at which the task force released its report, said: "My focus is really saying there are a lot of excellent recommendations here and to stay focused on putting those in place." Eggert reported from Lansing, Michigan. AP reporter John Flesher in Traverse City, Michigan, contributed to this report.